I learned about BioFreeze while visiting my chiropractor. Its what they use on their patients. I rub biofreeze into my aching shoulder and the heat truly seems to melt the pain away. can truly feel a difference in a matter of minutes. I also like the fact that it is greaseless and stainless and though the smell is not unpleasant, it does disappear in just a short while. For me, it works just as well on my shoulders as it does on my back. I don’t have to massage it in either, just gently rubbing and it seems to sink to my deepest pains. muscles, if not the best I have tried. I carry it with me to work for those days when the aches seem just a little too much to bear. 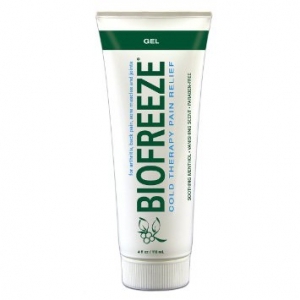 Biofreeze is a clear gel and though it disappears while you are rubbing it in, the effects last for hours. I can still feel its penetrating heat while I am driving down the road even an hour or two after leaving the doctors office.